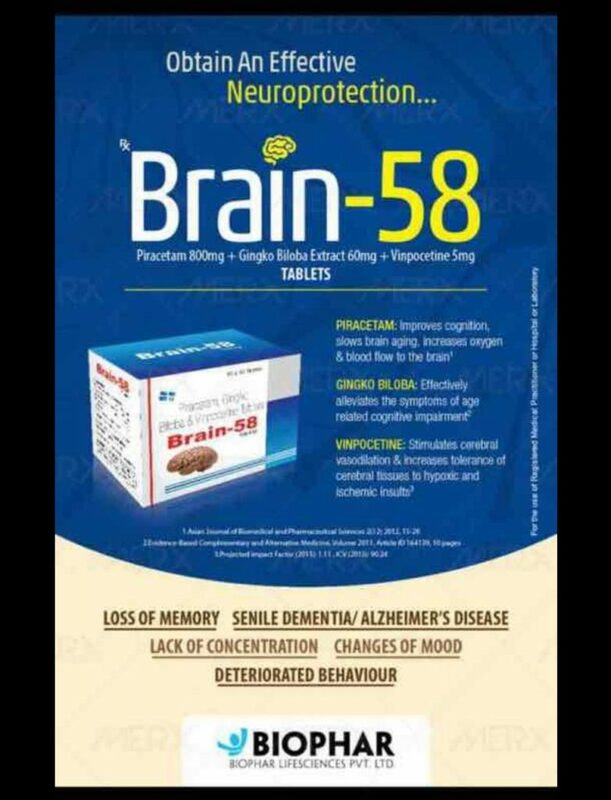 Brain-58 is made with salt having composition Piracetam 800mg + Ginkgo Biloba Extract 60mg + Vinpocetine 5mg. It is top product available for pcd pharma franchise on monopoly basis. The products has been marketed directly by Biophar Lifesciences Pvt. Ltd and is being manufacured in the form of pharma tablets. When piracetam effects the glutamate in the cerebellum, the center of motor function, motor planning skills improve. Second, piracetam most likely improves blood flow to the brain and oxygen uptake by the brain by activating acetylcholine, a neurotransmitter involved in motor planning, memory and organization. Effectively alleviates the symptoms of age related cognitive impairment. It’s well known that ginkgo has anti-inflammatory and antioxidanteffects. If a headache or migraine is caused by excessive stress, ginkgo may be useful. Additionally, if a headache is related to reduced blood flow or constricted blood vessels, ginkgo’s ability to dilate blood vessels may improve symptoms. Stimulates cerebral vasodilation & increases tolerance of cerebral tissues to hypoxic and ischemic insults. Vinpocetine is also used for preventing and reducing the chance of disability and death from ischemic stroke. This is the type of stroke that occurs when a blood clot stops blood flow in the brain, causing brain cells (neurons) to die because they are not receiving oxygen. 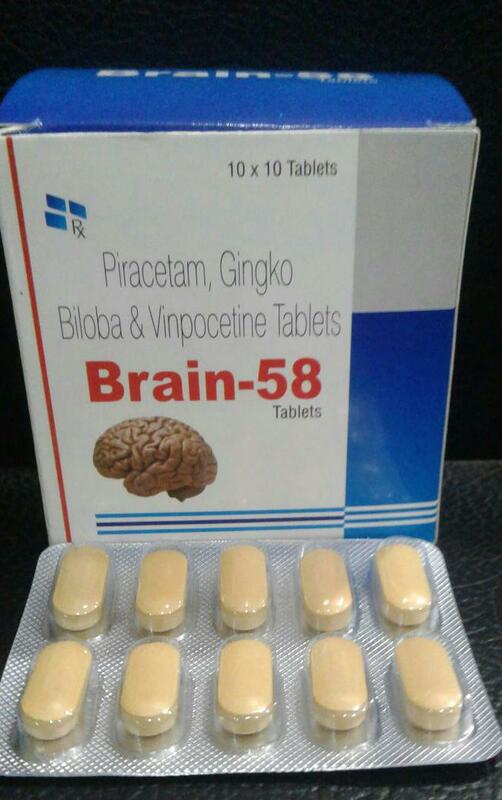 Pharma Franchise on Monopoly Basis : The Brain-58 tablets are available by Biophar Lifesciences for PCD Pharma Franchise in all the vacant districts and areas on Monopoly basis. Feel free to submit franchise enquiry at info@medivaxiapharma.in for more details.